Details of Event: “Exploring Axis Mundi: The Still Point At The Center Of The Turning Universe”, a solo exhibition by Chicago artist Jason Brammer, opens at Firecat Projects on Friday, February 24th from 7-10pm. The exhibit will debut a new series of mixed media paintings and graphite drawings inspired by symbology, alchemy, and spiritual iconography. 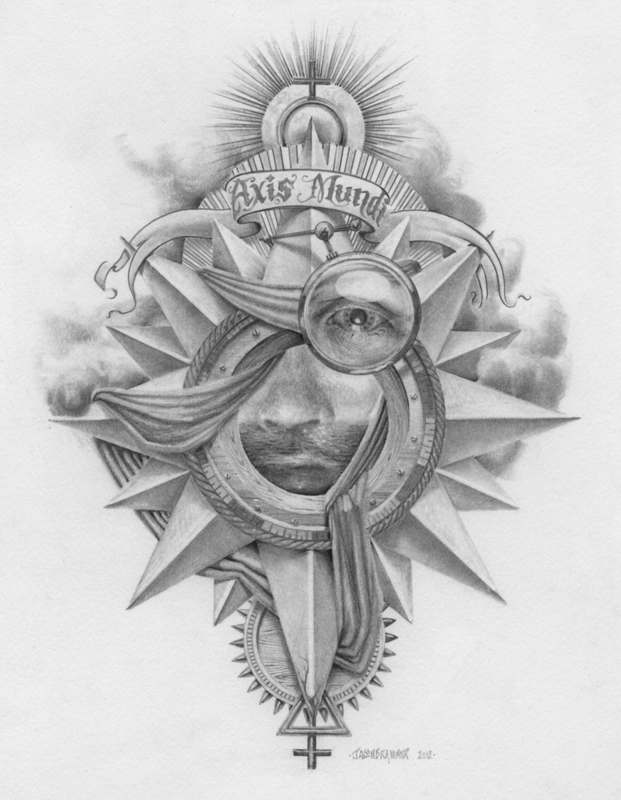 At the core of the show is the concept of Axis Mundi (meaning, “axis of the world”), which has been thought of as a portal between the earthly and heavenly realms in various religious and mythological traditions. Reflecting on these themes, Brammer has blended geometric shapes and patterns, flowing organic tendrils, esoteric symbols, and all-seeing eyes into compelling visual tapestries with paint and pencil. In addition to the opening reception, Brammer will be at the gallery on Saturday, March 10th at 2pm to chat about his art and creative process. See Jason Brammer’s artwork at www.jasonbrammer.com. Admission Price: FREE (Opening reception, artist talk, and exhibition are all free of charge). Jason Brammer never ceases to amaze me. His work is incredible and intriguing, and always thought provoking. I hope to be attending his opening reception at Firecat Projects!